A price floor is the lowest price that one can legally charge for some good or service. Perhaps the best-known example of a price floor is the minimum wage, which is based on the view that someone working full time should be able to afford a basic standard of living. The federal minimum wage in 2016 was $7.25 per hour, although some states and localities have a higher minimum wage. The federal minimum wage yields an annual income for a single person of $15,080, which is slightly higher than the Federal poverty line of $11,880. As the cost of living rises over time, the Congress periodically raises the federal minimum wage. Figure 1. 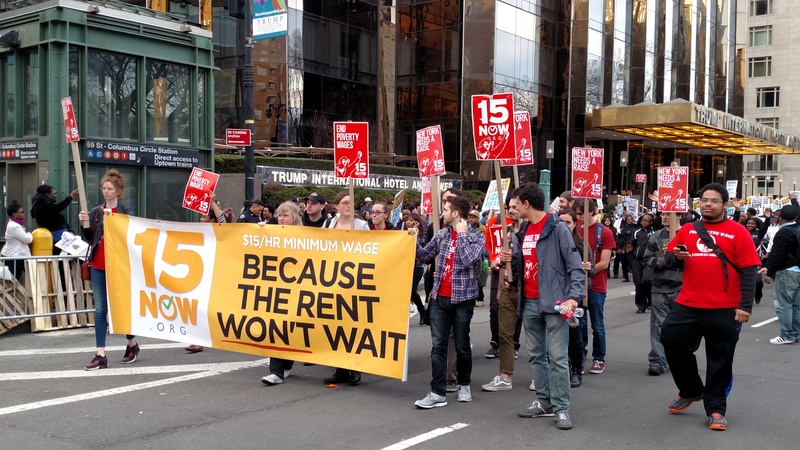 Protesters call for a $15 minimum wage. Price floors are sometimes called “price supports,” because they support a price by preventing it from falling below a certain level. Around the world, many countries have passed laws to create agricultural price supports. Farm prices and thus farm incomes fluctuate, sometimes widely. Even if, on average, farm incomes are adequate, some years they can be quite low. The purpose of price supports is to prevent these swings. The most common way price supports work is that the government enters the market and buys up the product, adding to demand to keep prices higher than they otherwise would be. According to the Common Agricultural Policy reform passed in 2013, the European Union (EU) will spend about 60 billion euros per year, or 67 billion dollars per year (with the November 2016 exchange rate), or roughly 38% of the EU budget, on price supports for Europe’s farmers from 2014 to 2020. Figure 2 illustrates the effects of a government program that assures a price above the equilibrium by focusing on the market for wheat in Europe. In the absence of government intervention, the price would adjust so that the quantity supplied would equal the quantity demanded at the equilibrium point E0, with price P0 and quantity Q0. However, policies to keep prices high for farmers keeps the price above what would have been the market equilibrium level—the price Pf shown by the dashed horizontal line in the diagram. The result is a quantity supplied in excess of the quantity demanded (Qd). When quantity supplied exceeds quantity demanded, a surplus exists. When a price floor is set above the equilibrium price, as in this example, it is considered a binding price floor. Figure 2. European Wheat Prices: A Price Floor Example. The intersection of demand (D) and supply (S) would be at the equilibrium point E0. Economists estimate that the high-income areas of the world, including the United States, Europe, and Japan, spend roughly $1 billion per day in supporting their farmers. If the government is willing to purchase the excess supply (or to provide payments for others to purchase it), then farmers will benefit from the price floor, but taxpayers and consumers of food will pay the costs through higher taxes and higher prices. Agricultural economists and policy makers have offered numerous proposals for reducing farm subsidies. In many countries, however, political support for subsidies for farmers remains strong. This is either because the population views this as supporting the traditional rural way of life or because of industry’s lobbying power of the agro-business. We mentioned earlier that the minimum wage is a good example of a price floor, since employers are required to pay no less than the minimum wage for workers. The following video makes a strong case for why a minimum wage causes a surplus of labor, i.e. unemployment. As you watch it, consider what you think about a minimum wage. Neither price ceilings nor price floors cause demand or supply to change. They simply set a price that limits what can be legally charged in the market. Remember, changes in price do not cause demand or supply to change. In other words, they do not change the equilibrium. Price ceilings and price floors can cause a different choice of quantity demanded along a demand curve, but they do not move the demand curve. Price controls can cause a different choice of quantity supplied along a supply curve, but they do not shift the supply curve.